A massive rescue operation is underway off the coast of Indonesia for a Lion Air flight with 189 people on board that lost contact with Jakarta air traffic control about 13 minutes into its 80-minute flight. As of midday, October 29, there had been no reports of survivors. Lion Air Flight JT610, which was flown by a Boeing-737 Max 8 able to hold 210 people, was a on a regular route between Jakarta’s Soekarno-Hatta Airport and the city of Pangkalpinang in the Bangka Belitung Islands. The plane departed at 6:10am with 189 passengers and crew and was scheduled to land at 7:30am local time. One child and two infants are among the passengers reportedly among the passengers of Lion Air Flight JT610. Muhammad Syaugi, head of the national search and rescue agency, is quoted in various media reports as saying Lion Air Flight JT610 had plunged into Karawang Bay, West Java province. Water at the crash site is said to be between 30-35 metres (about 98-115ft) deep. No distress message had been detected from Flight JT610s Emergency Locator Transmitter, Mr Syaugi reportedly said. Debris has been located on the surface of the ocean about two nautical miles from where the plane lost contact”, he told a media briefing, adding the aircraft had requested a “return to base” before disappearing from radar. Dr Soerjanto Tjahjono, head of Indonesia’s national transportation safety committee (KNKT), told a media briefing that the Boeing 737 Max 8 had entered service in August this year, with records showing it had logged about 800 flight hours. Lion Air is thought to be the world’s first commercial operator of the Boeing-737 Max 8. Local media reports say some 20 staff from Indonesia’s Ministry of Finance are believed to be on board the plane. In a statement Boeing said it “was deeply saddened by the loss of Flight JT610”. 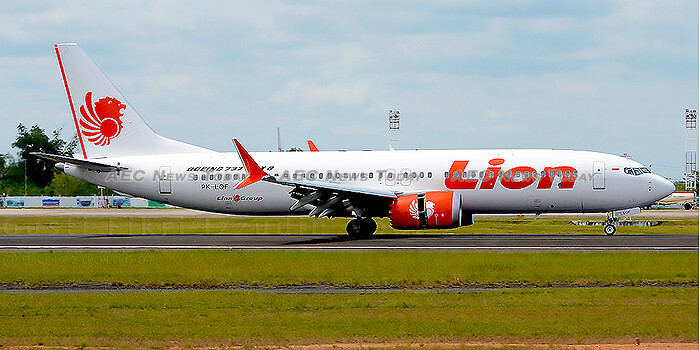 Established in October 1999 with operations commencing some eight months later, PT Lion Mentari Airlines, through the Lion Air Group, is Southeast Asia’s largest airline entity with over 300 aircraft in services. In 2015 it took delivery of a record 57 aircraft. Bangka Belitung is best known for tin mining, accounting for about 90 per cent of Indonesia’s tin. In recent years it has begun emerging as a domestic tourism destination. Indonesia has a chequered air safety history. The last major air crash occurred on December 28, 2014 when AirAsia Flight QZ8501 from Surabaya, Indonesia to Singapore crashed into the Java Sea off Borneo with 162 passengers onboard. There were no survivors. This has been a breaking news story. Updates are now concluded for this story.